So, I’ve changed from my lovely dress that I wore at work (which I forgot to take photos of this morning, but don’t worry, I’ll wear it again) to pajamas! If you read my Liebster award post you might remember that I especially have a huge love for pajama pants. I’m now sitting here in my amazingly comfortable outfit waiting for the #bloggerschat to start on Twitter. I really enjoyed the chats last night, so when I found out there is another one tonight I really wanted to join. I really should be going to bed, but as long as I’m prepared and just can crawl down under the covers afterwards it’s okay. Since I love my pj’s so much and my outfits posts are among my most read, I thought, why not show you what I’m wearing tonight? Robe and pants are from Ralph Lauren. The robe has been in my possession for a year now, and the pants were a Christmas gift to me from my dog. (He’s amazing at buying me gifts. I always get EXACTLY what I want!) The shirt is from Calvin Klein and made in modal, which is an amazing fabric for sleepwear. It’s so incredible soft! Last of all I’m wearing my fluffy slippers. 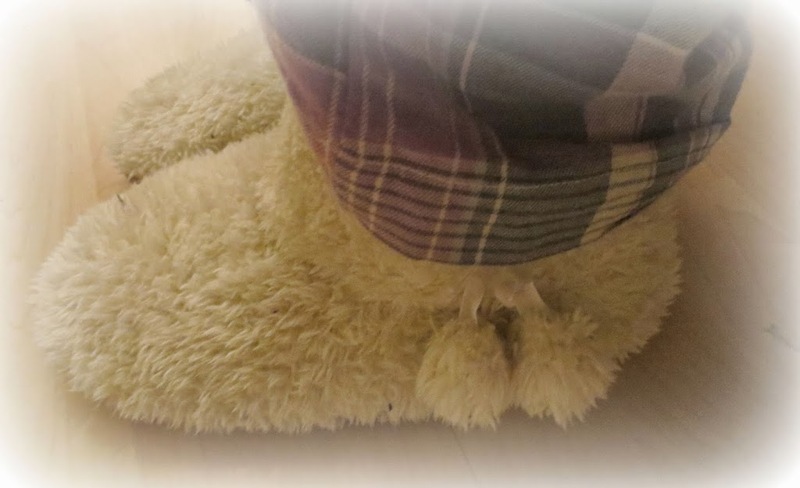 It has become quite cold again, and not very spring like, so I need to warm my feet up. Hope to see you in the chat soon, or maybe hear a word from you if you found my blog through the chat? This entry was posted in Fashion and tagged Calvin Klein, Ralph Lauren, Sleepwear by Anna S. Bookmark the permalink. Pajama pants are the best! Thank you! omg I am seriously wearing almost the same thing right now haha! I always change straight into PJs as soon as I get home from work! You look so cute! What an original outfit post, love your night outfit!